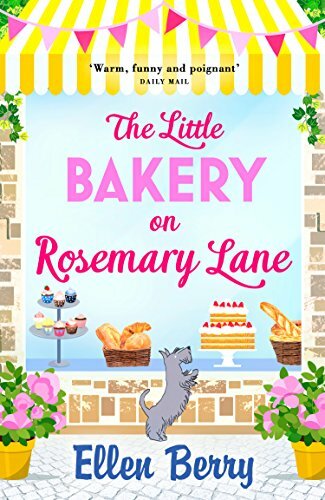 As Roxanne reacquaints herself with life on Rosemary Lane, she slowly makes a surprising discovery: the people who live in Burley Bridge are, well, just people – different from the fashion set she’s used to, but kind and even interesting. Michael, a single dad trying to make a go of a small bakery, particularly so. Little by little, cupcake by cupcake, Roxanne and Michael fall into an unexpected friendship. Could there be a life for Roxanne after all, in the place she’s spent years trying to escape. ‘I’m-fine-honestly,’ she barked, causing Tristan to spin his head around from the art department. Roxanne started rummaging in her top desk drawer, not because she needed anything but to give herself something to do. Like the top of her desk, it was a terrible tip. She delved amongst staplers, rolls of Sellotape, parcel labels, bulldog clips, cans of hairspray, notebooks and lip balms in a cacophony of flavours, willing Serena to stop giving her sympathetic glances, and wishing everyone would just leave her be. Roxanne wasn’t sure she could handle anyone being kind to her right now. She thought again of that time with the fish slice, when her mother had smacked her upper arm: it wasn’t the actual event itself that had triggered her tears. It had been later, when she’d run out of Rosemary Cottage and up into the hills by herself, and had happened to come across Len from the garage with his wife, Pat, and their two young children. They were out with their dogs and had beckoned her over to join them. Hey, what’s happened, Roxy? You look all upset! People had called her ‘Roxy’ then. Not anymore; she had cast that off like an unwanted jacket when she’d moved to London. Pat had hugged her, and that’s when the tears had flowed. Roxanne shut her desk drawer, delved into her bag and pulled out the small notebook in which she wrote copious to-do lists. There was tons to get on with, and keeping busy would at least get her through the rest of the day. She had a shoot coming up and she needed to call in clothes and accessories from fashion PRs, as well as trawling her favourite vintage shops for quirkier pieces. She wanted to book a new model – a fresh face – rather than one of her regular girls, which meant arranging a casting. Plus, there were Kate and Serena’s shoots to oversee, and a whole raft of product launches Roxanne should show her face at over the coming week. She made a barrage of calls until lunchtime rolled around, at which point she grabbed her bag and darted out of the office before anyone could ask to join her. On a bench in Golden Square, clutching a chicken sandwich she didn’t want, she called Sean. ‘Hey, I’m okay for a couple of minutes,’ he said gently. ‘For the party,’ she prompted him. Ellen Berry is an author and magazine journalist. Originally from rural West Yorkshire, she has three teenage children and lives with her husband and their daughter in Glasgow. When she’s not writing, she loves to cook and browse her vast collection of cookbooks, which is how the idea for this story came about. However, she remains the world’s worst baker but tends to blame her failures on ‘the oven’.